As the recognized leading PMO firm, we have provided thought leadership in the PMO area with subject-matter expertise, research, tools and best practices for over ten years. Our Next Generation DNA of the PMO framework is being implemented in companies worldwide. Find out more about our DNA of the PMO framework.. Hundreds of companies and organizatons around the world have attended our seminars and training programs and apply our next generation PMO approach. 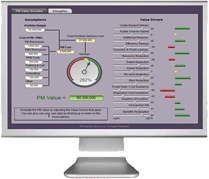 "The PMO facilitation gave our project management efforts a jump start. We covered a lot of ground in a short period and helped us to bring a lot of different stakeholders on the same page. We are also better aware of the real value of PM and how we need to measure and articulate it." What comes to mind when you think about the word “PMO?” If you think of more work, documentation, processes and red-tape, you are not alone. Whether you are trying to bring up your child in a disciplined environment, or you are trying to implement the discipline of project management practices, you go through a similar struggle. You built the project management office (PMO), but they are not coming. You have worked hard and created standard methods and processes, but project managers and team members are not using them.